While Indian cuisine is filled with a variety of healthy foods, including spices, beans and vegetables, that doesn't mean it's going to help you lose weight. Weight loss is about reducing your calorie intake, no matter what type of food you eat. If you're trying to lose weight, starting the day off with a healthy, calorie-controlled Indian breakfast is a good way to go. When it comes to weight loss, you need to take your overall calorie intake into consideration. The number of calories you need a day to lose weight varies from person to person. Your doctor may be able to help you determine your daily weight-loss calorie needs, which may range from 1,200 calories to 1,800 calories a day. Once you know your daily calorie needs to help you lose weight, divide them equally between your three meals, leaving 100 to 200 calories for a snack. An Indian breakfast to lose weight should contain 350 calories to 550 calories. Even if you're short on time, it's important to carve out a few extra minutes to put together a healthy breakfast on your weight-loss diet. Two whole-wheat roti topped with 2 tablespoons of chutney and served with 1 cup of nonfat milk makes a healthy, quick Indian breakfast option. This meal contains 430 calories. If you have any leftover boiled potatoes, you can make jeera aloo, or potatoes with cumin, fairly quickly. A healthy calorie-controlled breakfast might include a 1 1/2-cup serving of jeera aloo with one roti for 400 calories. If you have more time to eat, you may be able to enjoy more traditional foods at your breakfast meal. 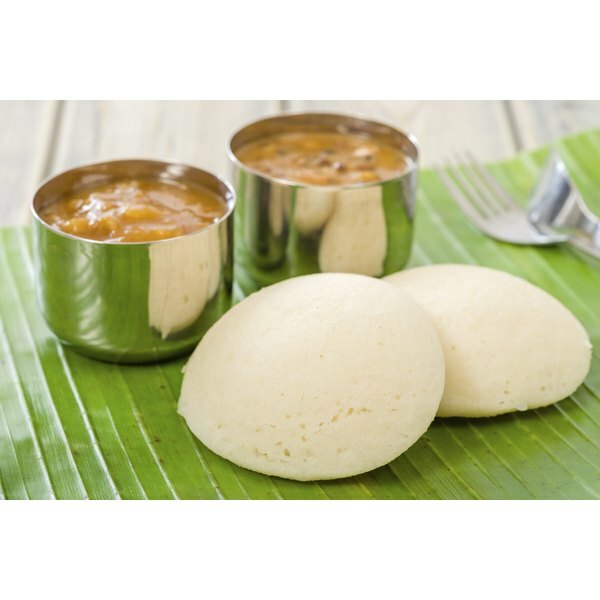 For example, three servings of plain 3-inch idli or dosa with 2 tablespoons of chutney and 1 cup of nonfat sugar-free lassi for 410 calories makes a good option. Also you might try 1 1/2 cups of rice sevai upma made with whole-wheat vermicelli and cashews topped with 2 tablespoons of chutney. This meal has about 365 calories. For those really short on time, you might do well with a meal you can take with you. A mango lassi made with 2 cups of nonfat yogurt and 1 cup of mango blended with ice makes a good breakfast on the go. This drink has 375 calories. You might also enjoy a chutney sandwich made with two slices of whole-wheat bread topped with 3 tablespoons of chutney and a cup of chai tea made with 1 cup of nonfat milk to eat on the go. This meal has 370 calories.